Today was Gideon Sunday, at least where we live. It may not be the same in every county or state, but once a year the Gideon’s spread out and each take a church to visit and share with. 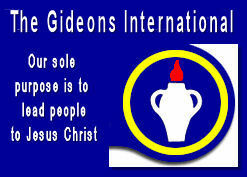 For those that may not know, the Gideons is an organization that does nothing but print and distribute Bibles. If you have ever been in a hospital or hotel room, there was probably a Gideon Bible there. That’s only a part of what they do. The Gideon’s hand out little red New Testaments to 5th graders in every public (and private) school that will let them in. There are several different little testaments for different occasions, such as college students, military personnel, and health care workers. They place full Bibles in doctor’s offices, hotels and hospitals around the country. The Gideons are also in over 190 countries around the world distributing Bibles to people that need to hear the Word of God. For every 3 hands that reach out for a Bible, they can only fill 2 of those today. The work is not done. Another group for instance, Wycliffe Bible Translators, focuses on getting the Word into new languages. There are many people groups that cannot read a Bible today in their own native language, perhaps not in any language. As our missionaries endeavor to reach all people groups of the world with the Gospel, we are still only 80% or so of the way to having a Bible printed in every language and dialect. We take the Bible for granted in our nation, where every home has perhaps 3, 4 or 5 setting on the shelf. Millions of people hunger for the Word, and we are not there yet. 1) Pray. Pray for the Gideons, Wycliffe Translators, The American Bible Society and others as they translate, print and distribute Bibles. Some governments of the world are hostile to the Bible coming into their areas, and some missionaries put themselves in harms way to go there. 2) Give. A one time gift is great; in my experience in ministry, a regular monthly donation is even better. It costs only a few dollars to print several Bibles, and in the case of the Gideons every dollar given goes to printing more. Their labor is voluntary, and their administrative costs do not come out of your donation. 3) Go. The Gideons are lay church members from the community, not ordain ministers or career missionaries. Missions are taking place around the corner, not just around the world. God is often interested not in our ability, but in our availability. As the way missions are funded has changed in recent years, organizations such as the International Mission Board has encouraged church groups to participate in short term projects, sometimes no longer than a week or two. “Going” might just be across the street or down the block. Go ye into all the world and preach the gospel unto every creature. This entry was posted in Bible and tagged Bible, Gideons, missionaries, missions, Word of God, Wycliffe Bible Translators. Bookmark the permalink.